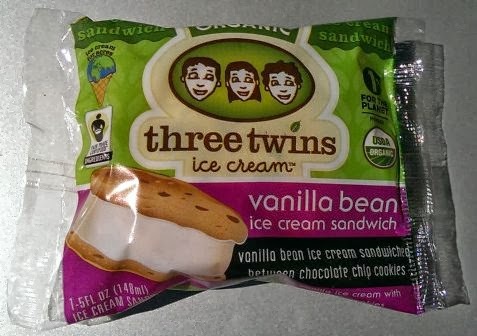 [New for 2013] So I went to Whole Foods at lunch and three twins ice cream was on sale! A dollar off pints, 30 cents off individual ice cream sandwiches, and a buck thirty off a four pack of sandwiches. Translated, that means it's time for lunchtime dessert! Now while I felt the cookies dominated their sea salted caramel ice cream sandwich in a bad way, this vanilla sandwich totally works for me despite the high cookie to ice cream ratio. The cookies feel fresh and have a unique taste that I seem unable to describe in a single serving. They don't taste of chips ahoy or any other commercial cookie, but I am digging them. They are super soft and surprisingly crumbly. In fact, I don't think I've had an ice cream sandwich with a cookie this soft. Three twins has tweaked the recipe to create a cookie that pretty much just crumbles apart when you eat it. In general I would mock the high crumb potential, but the big crumbs work here. 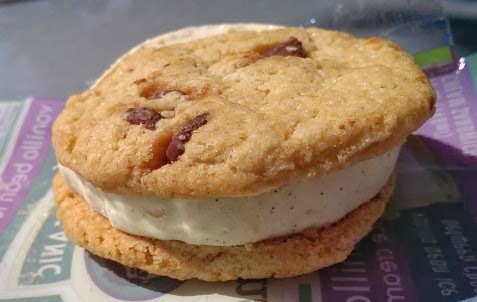 Once you take a bite, the cookie breaks apart and blends with the organic vanilla ice cream in your mouth and totally hits the spot. Other notables: full size chocolate chips in the cookies. We've also got quality organic ice cream in this treat with lots of vanilla bean flecks, I just can't guarantee you'll taste a lot of it over the cookies. It's there, it's just there for more of a combo effect with the cookies. Would I pick these up again as a neat treat on the way home from a shopping run? Yeah, definitely. Could it use a little more ice cream? Sure, I wouldn't mind, but it's fine just the way it is. Nice Job.